Today we receive the Peak Energy of Tone 6 brought by the Monkey/CHUEN. Tone 6 is the energy of flow and pattern of movement. Tone 6 is compared to the energy of a practiced athlete whose rhythm of movement is second nature. We no longer think about each step. We engage with an intention and take off. Monkey/CHUEN is the Time Weaver who creates the tapestry of our Life by weaving all our experiences together. 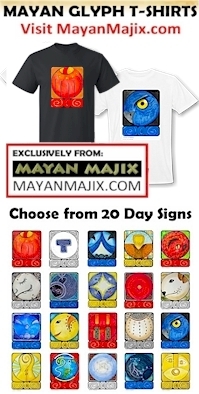 The CHUEN glyph illustrates “time rolled up” on the head of the Monkey. Monkey sees the beauty of each thread. 6 Monkey/CHUEN engages us in creating the Beauty to discover the Joy of Living. We are shown a Way forward and pattern of movement to Awaken a New Child of Spirit. I woke up thinking about Art and how special it is. This summer has been an ongoing experiment of Arts and Crafts. There’s been a creative urgency to get other things done, so I can play. My waking memory was the Summer Recreation program in grade school. The school building was transformed into a magical place, where doors were left open with morning breezes passing through. We had free reign to come and go, and choose any activity or art project to work on without supervision. The walk there was just as magical as the destination. The sidewalk was lined by Catalpa trees that are native in Kansas and central parts of Northern America. Their huge leaves offered shade from the morning sun and cast patterns of shadow and light. Their flowers were strewn along an uneven sidewalk raised up by their roots. Cement squares glittered, worn down to reveal bits of sparkling sand. I still remember the feeling of freedom, and the anticipation of what I might choose to create that morning. There are few moments so vividly etched in my memory. We are given a treasure trove of memories to find somewhere in time. Tone 6 is the “taking off” point in the flow of this trecena. “Six is the movement of volume through space that creates time. This energy in action is like the art of dance or a great athlete in motion. Six facilitates dynamic developments in all aspects of life.” We’ve been given all the Inspiration for a Dream we would create, and the artist’s tools and medium with which to create the Art of Living. The CIMI trecena has brought the Master of ALL Art, Monkey/CHUEN. The Dog and the Monkey are said to have an affinity. Residing together at the center of the Tzolk’in, in the positions 10 and 11, they are the aspects and personality traits most Central to the Creator. They are the Day Signs of the Unconditional Lover and Creator. Monkey and Dog reflect the real Joys of Living. Love ignites our creative urge and brings Spirit to Life. Art is manifested in the physical world from the realm of imagination. Creation is an activity of Pure Spirit. We create our most beautiful art from the things we love. Human inherited the Gift to Create Art. All living things are the Artwork of the Master’s Hand. The Monkey engages us in curious play. It sees how a thread of experience over here, would be beautiful placed with a thread over there. Human is the only Creation with the ability to travel through time. We are capable to re-experiences things that happened long ago, to imagine something in the future, and all times in between. Just as we are connected to the Creator through the Heart, so are we connected through our Imagination. Some of our best ideas can come out of Art. Whether we are sewing, constructing, painting, making music, or telling stories, the cares of the world seem to vanish away. Through Art, our Spiritual “Receivers” are tuned-in to amplify the Voice from Spirit. We can recognize a Voice of Spirit that suggests what the next embellishment should be. 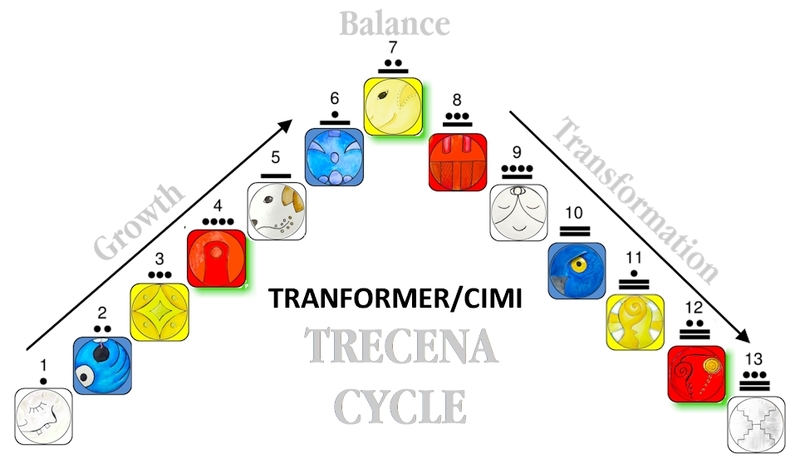 The 6th Tone of the CIMI trecena is offering a teaching about the rhythm, flow, and pattern of movement that would help us to complete a climb of Spiritual Growth that would manifest a New Birth of Spirit. Even laying out the clothes for a new baby, is an imaginary journey of Art. We are called to create the Art of our Future, imagining what Harmony and Peace would look like. We can look to the darkness of our past to see how our lives have been transformed, to see how the ultimate accomplishment was made even more beautiful. And we can look at the darkness of today, imagining what beauty from contrast it holds the potential to create. We can imagine the future as it looks when it is completed. Together, the Dog and the Monkey reflect the Heart and Mind of a child. When we were children we created whole worlds in our imagination. Another memory recalled from school was the day a little girl showed me her pretty new ring. She noted that it had come in a tiny brown envelope. I remember thinking I had seen such an envelope in a kitchen drawer, and went straight to find it when I got home from school. If I could find such an envelope, there was bound to be a ring. We can look to the children around us to lead the way. They are the ones that still believe that anything is possible. My little 9 year old neighbor, Julian, who offers to collect the trash has become a new friend. When he knocked 5 times on day, I had a sense he was wanting my time. I asked him if he’d like to do a craft sometime. He was excited about the idea, so last week we shared a craft painting rocks. I delighted in his amazement, pouring mixed acrylic paint on rocks that turned into marbled beauty. He said Thursdays should be craft day every week. His visits are now accompanied by others. There was a small crowd of new visitors last night. My old grown-up thoughts that letting Julian in might be more than I bargained for, now feels like the more the merrier. To all my relations, may we be engaged in the Joy of Living. May we spend our time looking for Love and Beauty. May we make time for the things we really love to do. May we engage in the Art of our Life, and discover old happy memories. May we recognize “Loving” and “Creating” for the Special Gifts they are, and the Way we Design our own Future and Recreate our Past. May we Dream of being children again, when dirt and water was all we needed to make a pie. May we imagine running through life just because we can, feeling the wind in our hair, and the exhilaration of just Being Alive. May we forget about the climb and the steps to get there, and run toward our next opportunity to Create Love and Beauty. May we give thanks for Beauty created by God’s Hand in the Artwork of a Living World. “A Way opens before us. The colours of this card is lovely; it certainly correlates to joy of living.